This sword belongs to Jyo Jyo Saku ranking. Habaki : Gold foiled single Habaki. Blade length : 71.4 cm or 28.11 inches. Sori : 1.6 cm or 0.62 inches. Width at the hamachi : 3.07 cm or 1.20 inches. Width at the Kissaki : 2.1 cm or 0.82 inches. Kasane : 0.52 cm or 0.20 inches. Era : Late Edo period.1790. Shape : Regular width and thickness Katana with large Sori. The Kissaki is long. Nice shape Katana. Hamon : Nie Deki, Gunome Midare with thick Nioikuchi and Togari Gunome. Boshi is Midarekomi Togarigokoro style. and their collaboration still survives. Motohira passed away in 1826, aged 83. Saya : Reddish brown Saya. with Shakudo and gold color. Menuki : Shakudo, perosn is engraved with gold color. 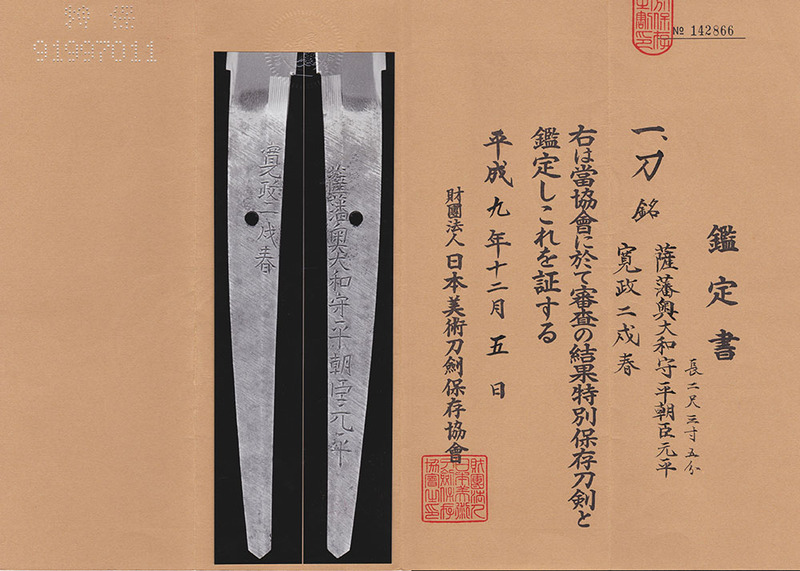 From Aoi Art: Motohira was highly regarded as a sword smith in Satsuma. Especially his Jigane is well grained and blackish. The Hamon is Soshu Den. Kissaki is Midarekomi. It reminds of Soshu O Shizu. This blade has large Jinie and many Chikei. In Ha, there are a lot of Sunagashi and Kinsuji.